Milokopi or mylokopi (Shi Drum – Umbrina cirrosa), is a delicious Mediterranean fish recipe which I made having Briam in mind. This way you have your baked fish with some vegetables on the side. I used the vegetables I had at home that day but you can also add some carrots and zucchini (courgettes) as well. The fish does not need too much time to cook, so the vegetables must be cooked first and when almost ready, the fish is added on top and cooked (about 25 – 30 minutes for a fish around one kilo and more for bigger fishes). You can make this recipe using other large fishes such as cod, European sea bass, sea bream, grouper, trout etc. 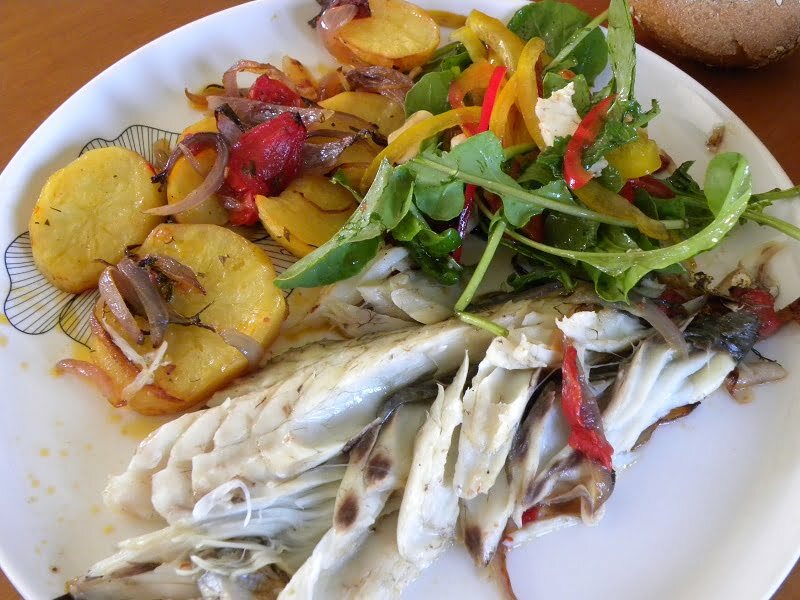 without of course restricting it only to Mediterranean fish. Briam is a very versatile Greek dish so you can add more vegetables if you like. The second time I made it with sea bream, I added slices of zucchini and carrots as well and it was even more delicious! Milokopi or mylokopi (Shi Drum - Umbrina cirrosa), is a delicious Mediterranean fish recipe which I made having Briam in mind. This way you have your baked fish with some vegetables on the side. Ask your fish monger to scale and gut the fish. Put the potatoes, onions, garlic, dill, tomatoes, salt, pepper and oregano in a large baking tin and mix well. Add olive oil, lemon juice and wine. Bake for about half an hour or until the potatoes are cooked on one side. Wash the fish and season with salt, pepper and oregano, inside and out. Mix the vegetables and cook until the vegetables are almost tender, for about 15 more minutes. Place the fish on top, adding a few tomatoes and liquid from the pan, and cook for about 30 more minutes (no need to turn it over). Note: If you see that the potatoes are beginning to stick to the pan, add the water and wait for 10 minutes before serving. A wonderful dish! So flavorful and healthy. So fresh and tasty! A lovely way to prepare the fish, Ivy.